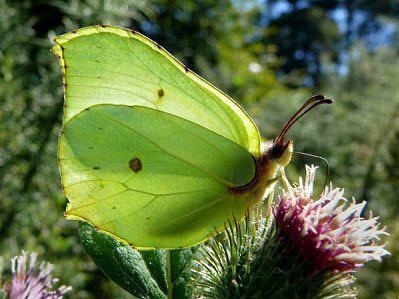 Special features: Brimstone butterflies are often the first and last butterflies seen in the UK each year. They go into hibernation around October time and emerge on the first sunny spring days in February or March. Brimstone is an old-fashioned name for sulphur, which is a bright yellow coloured element. The Brimstone butterfly is so called because it is a similar colour. The female is much more pale in colour than the male, and in flight could be mistaken for a Large white butterfly. Brimstones always perch with their wings folded above their backs, so the upper surfaces of the wings are only seen in flight. On the upper side of each of the four wings there is a small yellow dot (see photo above). The colour and shape of the Brimstone is a perfect imitation of a leaf, right down to the thick veins and brown damage coloured patches.